When To Apply Lime To Lawn? / When To Apply Lime To Lawn? The grass is always greener on the other side of the fence. I can tell you that I refuse to believe in that saying. Why is that so? Well, this year I had a lot of things on my mind and liming the lawn was not one of them. Don’t let your neighbors think you are a weirdo when you are drinking your first cup of coffee on your porch and staring at their lawn. Why wouldn’t we enjoy our coffee with a beautiful sight over dew covered grass and flowers in our yard? We just need to learn when to apply lime to lawn! What Is Lime Lawn Treatment? Just as any other living organism, plants require certain nutrients for their proper growth. These nutrients, such as calcium, potassium, iron, phosphorus, are unavailable to the plant if the soil becomes more acidic (its pH falls below 6). Applying lime to lawn helps you get rid of this problem since the lime is an alkaline substance which raises the pH of your soil. In addition, lime lawn treatment can also help kill fleas in your garden. Read more about how lime kills fleas here: Does ﻿Lime Kill Fleas In Your Garden? However, before applying lime, you should consider doing a soil test. Unnecessary liming of the lawn can damage the soil itself and it will give it a yellowish color. This test will provide you with the information about soil’s current pH and possible nutrient deficiency. The right time for you to lime your lawn depends on several factors. 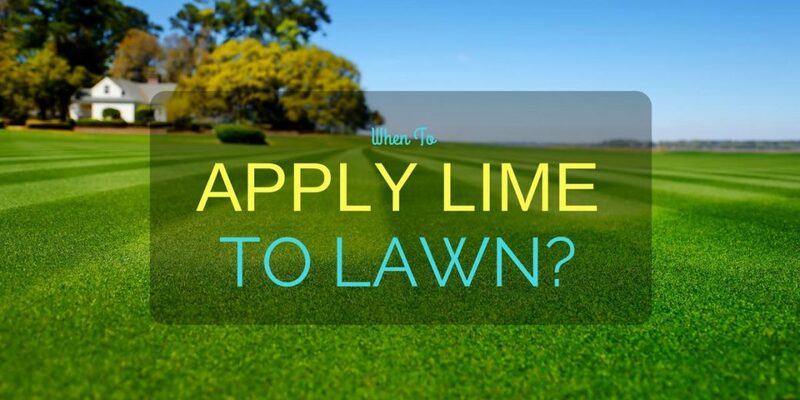 In general, lime can be applied at any time if your lawn needs it. However, don’t expect an instant effect of it. The lime needs some time for it to be completely dissolved and absorbed. You can notice the difference in the soil pH after four weeks of lime applying but it usually takes six to twelve weeks for its complete absorption. Some studies indicate that the best time for liming would be right when you are preparing your yard for planting. This will give a proper base for lime to be distributed equally to every part of the soil. Most gardeners lime their lawns in the fall or early spring. The reason why they do so is because it gives lime several months to be completely dissolved and the soil will be ready for spring planting. Before planting, you can test your soil to see if you did a successful job with your liming. If you are from a place which has those bone-chilling winters, you should apply your lime just before the first frost. The reason why you would want to do this is because the cycle of frosting and defrosting will help the lime to better penetrate the soil. This will give the best effect and ensure improving the quality of your soil. There are some limitations when it comes to liming and you should keep them in mind if you are considering doing it. If the soil is very wet, you should not apply the lime. It’s in your interest to spread the lime appropriately and wet soil will harden the lime thus making it difficult to spread. Treating your lawn with any other substances, such as herbicides, may not be suitable for applying lime at the same time. Many substances can interact with each other which can result into losing of the desirable effect or even worsen the health of the soil. There’s been a lot of research in recent years on the mixed effects of lime and other substances, but until we have some clear results, you should avoid using them combined. There are 2 types of lime: agricultural lime or ground limestone which contains calcium carbonate (CaCO3); and dolomite lime which also contains magnesium. Which type you will want to use depends on different factors, such as climate, soil type and even type of grass you want to plant. The amount of lime you are going to use depends on the level pH of the soil is changed. It usually goes by the rule: Lesser the pH, more lime needed. It looks like the fall is the best time for us to apply lime to our lawns. Certainly, there are some situations when we have to avoid liming, but proper preparation and knowledge should encourage us not to back off from it. Apart from understanding when the right time to apply lime is, we need to consider a right type of lime and amount we are going to use. If you have any questions or comments, please post them in the comments section below.